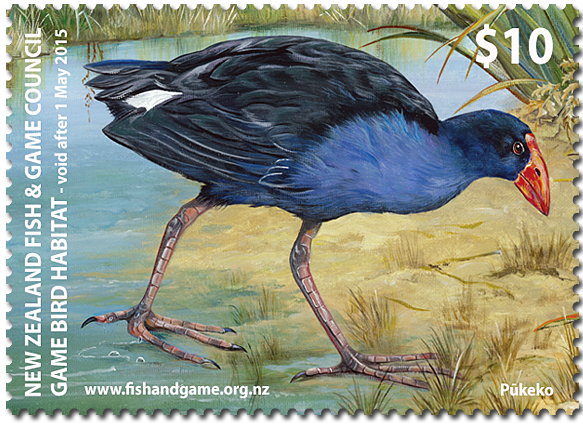 Virtual New Zealand Stamps: How the Kiwi Lost his Wings. When I was a child in the early 1960s, one of the then Government-owned radio stations, 1ZB had a children's request program every Sunday morning. Children could write in and request a story they wanted to hear. Every so often a Maori story would be included as well. I remember some of these such as Maui fishing up Aotearoa, Hinemoa and How the Kiwi Lost his Wings. I think out of these, this last one was my favourite. Now more recently I found a copy of this story so I've used it to help me create this post. I am so pleased I can share this story with you now. I question the role of two of the birds in this version but in the end, they don't affect the outcome much so I've decided to leave them in. They also have given me the chance to feature two extra stamps as well. The stamps have been chosen from various sources to add variety to this post. 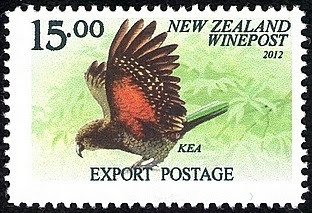 You will notice a couple of NZ Post definitive stamps; a health stamp; one of the popular round kiwi series; two stamps from local post - New Zealand Wine Post and one from the NZ Fish & Game Council. Links provided will take you to our posts on each of these. For other Maori legends, see our index page - New Zealand Maori. How Kiwi Lost His Wings. One day, Tane-mahuta was walking through the forest. He looked up at his children (the trees) reaching for the sky and he noticed that they were starting to sicken, as bugs were eating at their roots. He talked to his brother, Tane-hokahoka, who called all of his children, the birds of the air together. "Something is eating my children, the trees. I need one of you to come down from the forest roof and live on the floor, so that my children can be saved, and your home can be saved. Who will come?" All was quiet, and not a bird spoke. "E Tui, will you come down from the forest roof?" Tui looked up at the trees and saw the sun filtering through the leaves. Tui looked down at the forest floor and saw the cold, dark earth and shuddered. "Kao, Tane-hokahoka, for it is too dark and I am afraid of the dark." 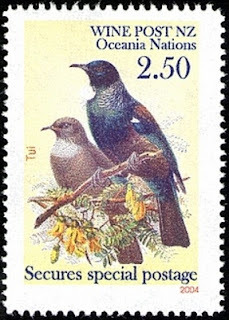 2004 $2.50 - New Zealand Tui. Local Post Definitive for delivery postage of wine and mail for Weston's Winery. "Tarapunga, will you come down from the forest roof?" Tarapunga looked up at the tree tops and saw how the trees provided shelter from the wind, rain and storms. Then he looked down at the forest floor where it was always wet from dripping trees. "Kao, Tane-hokahoka, for I do not like the forest floor, I like up here where the trees keep me safe from the storms." 1964 2½d + 1d - Tarapunga (Red Billed Gulls). 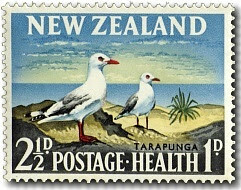 New Zealand Health Stamp - 2 values, one for postage and one for children's health camps. Health Stamps - Part Two. "Pukeko, will you come down from the forest roof?" Pukeko looked down at the forest floor and saw the cold, damp earth and shuddered. "Kao, Tane-hokahoka, for it is too damp and I do not want to get my feet wet." New Zealand Fish & Game fee for a hunting license. Wildlife - Game Bird Habitat. "Pipiwharauroa, will you come down from the forest roof?" Pipiwharauroa looked up at the trees and saw the sun filtering through the leaves. Pipiwharauroa looked around and saw his family. "Kao, Tane-hokahoka, for I am busy at the moment building my nest." "E Kea, will you come down from the forest roof?" Kea looked up at the tree tops and saw the warm sunlight. Then he looked down at the forest floor and saw how cold it was. "Kao, Tane-hokahoka, for I do not like the cold I like the warm of the sunlight of the tree tops." 2012 $15.00 - New Zealand Kea. Great was the sadness in the heart of Tane-hokahoka, for he knew, that if one of his children did not come down from the forest roof, not only would his brother loose his children, the trees; but his own children, the birds, would have no home too. "E Kiwi, will you come down from the forest roof?" 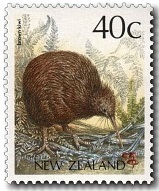 1988 40c - Brown Kiwi. 1985 - 1993 Native Birds Definitives. Great was the joy in the hearts of Tane-hokahoka and Tane-mahuta, for this little bird was giving them hope. But Tane-mahuta felt that he should warn kiwi of what would happen. "E Kiwi, do you realise that if you do this, you will have to grow thick, strong legs so that you can rip apart the logs on the ground and you will loose your beautiful coloured feathers and wings so that you will never be able to return to the forest roof. You will never see the light of day again for you will be a night bird, a hunter of the dark." All was quiet, and not a bird spoke, for they all knew what must happen to Kiwi. "Yes! Yes Tane-hokahoka, I will." 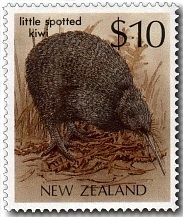 1989 $10.00 - Little Spotted Kiwi. Both Tane-hokahoka and Tane-mahuta rejoiced over this brave little bird for they knew what he was willing to do for the sake of the trees and the other birds. "E Tui, because you were too scared to come down from the forest roof, from now on you will wear the two white feathers at your throat as the mark of a coward. Tarapunga, you who are afraid of the storms, forever you will live on the seashore where the storms that crash upon the land are at their worst. Pukeko, because you did not want to get your feet wet, you will live forever in the swamp, wading in the water in search of your food. Pipiwharauroa, because you were too busy building your nest, from now on you will never build another nest again, but lay your eggs in other birds’ nests. Kea, because you liked the warm of the tree-tops and did not want to get cold, from now on you will be a bird of the high mountains far from the forest. The cold wind and snow will be your home. All you other birds. Those who sat silent and never offered to help. You who delight in singing all through the day. From this day you will never again sing at your best in full chorus other than at the rising of the sun and when the sun sinks to his bed." "E Kiwi, because of your great sacrifice, you will become the most well known and most loved bird of them all. Known as ‘te manu huna a Tāne’ - the hidden bird of Tāne, the god of the forest." Today this land has become a nation who takes the name 'Kiwi' as their official emblem. All over the world, the people of this land proudly wear and are known by the name of kiwis. And they remember this little bird, well known but hardly ever seen. 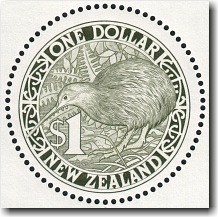 1988 $1.00 - Green Round Kiwi. This is the first of a series between 1988 & 2011. A good example of the kiwi used as a symbol of New Zealand. I like what you did with this story. Its laid out almost as a poem. Looks good and the few changes you made makes it read well. The strong point of this story is the moral. How brave little kiwi puts the welfare of others before his own. Among my people this is an important quality. I also like the stamps too. They add something different, something of you to this story. Yes this is it. The Bird story. I've just finished reading it to Nadine while she looked at the birds. She's been asking me for it but I could not remember all that. Yes there were all the emptions again. You wrote it well. My kids love this story too. Both Robert and Rebecca enjoyed Susan reading it today. They still remembered it from March. Rebecca thinks this version is different to back then. We talked about why it was good what Kiwi did for the other birds and trees. Robert got it straight away but Rebecca struggled with it. Just showed their personalities. You may not know this, not having school aged kids, but this story is taught in schools as part of Maori studies. Writers, why hasn't this post made your list of "Special Posts." While not containig any special or rare stamps, I like how you used the stamps to illustrate the story.